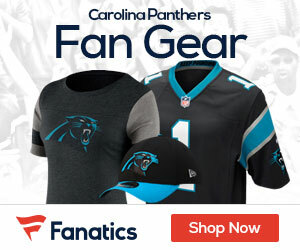 It has to be a miserable feeling if you’re Carolina Panthers head coach John Fox. He is in a contract year and prior to the team’s game against the Tampa Bay Buccaneers, were 0-1. Suffice it to say, he is coaching for his Panthers career. 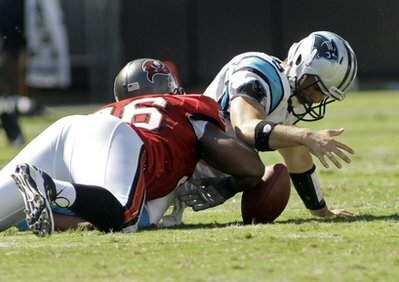 That aside, the Panthers had diffciulty keeping Matt Moore upright; as a result, Moore was intercepted twice and sacked four times. On the flip side, the Buccaneers quarterback Josh Freeman wasn’t great shakes, but was effective enouigh for Tampa Bay to shut down Carolina 20-7. Despite the score, the game was all Tampa as Freeman tossed a 14-yard strike to Earnes tGraham, giving the Bucs a 7-0 lead nearly halfway in the first quarter. the Panthers did tie things up at 7 on a 37-yard Moore-to-Steve Smith TD pass 3:17 into the second period. Freeman would throw another TD pass, this time a 35-yard pass to Mike Williams, which put the Buccaneers ahead 14-7. The third and fourth quarters were rather anemic, scoring-wise, as a pair of field goals (24 and 33 yards, respectively) by Connor Barth cemented the victory for Tampa Bay. Freeman was effective as he went 12-of-24 for 178 yards and a paiir of TDs while also rushing for 43 yards on just four carries. Moore, who would be replaced during the game by Jimmy Clausen, went just 6-of-16 for 125 yards with a TD and interception; Clausen wasn’t much better, going 7-of-13 for 59 and a pick. Carnell Williams led the Bucs’ rushers with 51 yards while DeAngelo Williams led the Panthers with 54 yards on 17 carries while Jonathan Stewart rushed 8 times for 43 yards. Kellen Winslow led all Tampa receivers with 4 receptions for 83 yards while Williams caught a pair for 54 yards and a TD. Steve Smith led the Carolina receivers with 3 catches for 66 yards and a TD while Dante Rosario caught 3 for 47 yards. Tampa Bay (2-0) plays again next Sunday when they return home to host the Pittsburgh Steelers while Carolina (0-2) looks to get into the win column as they remain at home to host the Cincinnati Bengals – also next Sunday.